When we first launched the ComplianceDesktop® | Compliance Technology Platform almost eight years ago, we started with one goal: to be the platform for the chief compliance officer the only place they need to go to manage programme needs. That vision still holds true today. Our focus as an organisation is targeted at evolving the ComplianceDesktop® | Compliance Technology Platform and making it an intuitive and flexible solution to manage all aspects of compliance and integrity risk programmes. This ties in with our firm’s goal of being the place where chief compliance officers come for strategic advice while providing them the opportunity to leverage the power of technology to turn compliance into a competitive advantage and drive results at the bottom line. We have continued to work diligently to make the ComplianceDesktop® | Compliance Technology Platform more intuitive and easier to navigate. We have added further languages out of the box (currently 18), enhanced help text throughout, and worked to simplify common administrative tasks. We are taking the platform mobile, making it is available when and wherever you need it. This has started with our Gifts, Travel and Entertainment module, and from there we will continue to expand our solutions while improving the flexibility to complete everyday compliance tasks on a device of your choice. Finally, we have increased the performance of the platform by simplifying the interface, making everything faster. 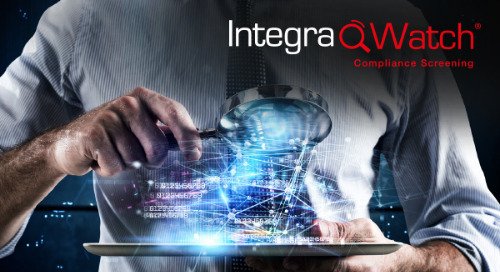 In our most recent release, we focused on our Screening module, which integrates the IntegraWatch® | Compliance Screening database, redesigning the profile of search results and adding new matching technology. The added technology gives major value to clients as it adds Boolean searches, multi-language searches, translated names searches and more, so you get only what you need and false positives are minimised. As daily monitoring started to become the standard in 2017, we revamped the method in which we send updates for ongoing monitoring, consolidating notes and making things easier to manage. In our Questionnaire module, we have recently added powerful question and answer-level reporting in addition to our newly-released aggregated reporting in the Third- Party module. Both will provide a single view to see all responses to a particular question in a questionnaire or all activities for each third party. In the case of aggregated reporting, there is no longer the need to run reports in multiple modules to then compile the information into a single report. This improvement saves our clients precious time but offers the same flexibility to export data in standard formats for visualisation. This year will be about continuing to expand the capabilities of the platform to provide the solutions needed to manage today’s integrity and compliance risks. We recently introduced our IntegraCall® | Secure Compliance Hotline product and an integrated Incident/Case Management solution that allows our clients to continue to benefit from the flexibility and time savings of having all their data on one centralised platform. We have significant plans to redesign how the Third-Party Module and Questionnaires are created and managed. The Third-Party module will be the central repository to onboard and manage all thirdparty data. We will continue to focus on driving flexibility and better integration with questionnaires which allows the user of the platform the option to configure more tasks on their own and not require development. In order to expand the reach of ComplianceDesktop® | Compliance Technology Platform, we will continue to expand the API functionality and mobile solutions to make the data work for you where you need it. Of course, we will continue to strive to improve every module within ComplianceDesktop® | Compliance Technology Platform to ensure that we continue to provide the most comprehensive platform in the market. 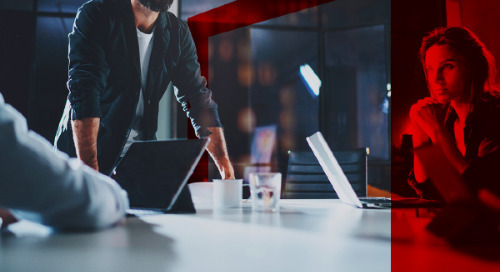 We aim to ensure we have the right features and functionality whether you need to onboard a partner, train employees, manage certifications or gifts and entertainment risks, understand conflicts of interest or track investigations. We want to provide our clients with the ability to interrogate their own data in a way that tells a complete story of where they need to focus their limited compliance resources.